Designs turn to accidents, and great ships to splinters, in this rousing tale of the Elizabethan navy’s finest hour. Spain and England were relatively recent rivals in the late 16th century, but their competition was fierce—pirate raid here, sea skirmish there, blood spilled wherever Spanish and English ships met. Among other things, Spain’s Philip II, a Habsburg ruler, had to keep England and France from allying. That possibility, writes British journalist Hanson (The Custom of the Sea, 2000, etc. ), was real enough when Mary, Queen of Scots, was alive. In those days, Philip avoided trying to overthrow Elizabeth “lest it prove a Pyrrhic victory, restoring England to the true faith only by placing a French queen upon the throne.” Readers without a keen sense of early-modern royal intrigues and alliances may be lost in the early pages of Hanson’s sprawling history, but in time things become clearer: with the French-hating (and, Hanson notes, memorably foul-breathed) Elizabeth safely on the throne, Philip was free to set his navy against hers in an effort not just to gain supremacy of the seas, but to launch Catholic revolts against the crown in Ireland and Scotland. 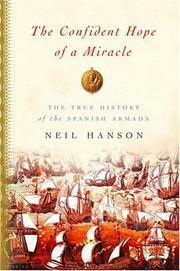 It was a pretty plan, but, Hanson observes, it overlooked the fact that the Armada “was never equal to the task it had been set.” Received wisdom to the contrary, Spain’s ships were fewer and less technologically advanced than the lighter, faster British ships they faced, and Philip made some tactical decisions that may well have doomed his fleet in advance. Hanson’s account of the great naval battle off the southern coast of England will thrill fans of C.S. Forester and Patrick O’Brian, whose fictional creations would seem to owe much to the Francis Drake the author ably portrays here. The aftermath, with Spanish survivors straggling ashore only to meet gruesome ends, is just as well told—and just as full of intrigue. Richly detailed, concisely narrated: a superb, myth-shattering portrait of an epochal event.